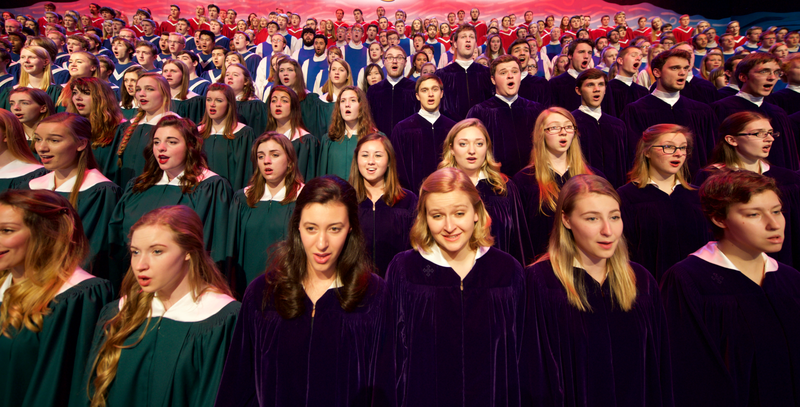 Since 1904, St. Olaf College has hosted choirs from across the country to share their talents and embrace the joy and community that arise from singing as one. The St. Olaf Choral Festival offers an exhilarating opportunity for choirs to experience instruction from world-renown conductor, Anton Armstrong, for two in-depth choral rehearsals, culminating in a rousing, collaborative concert alongside St. Olaf choirs. -> Participants will be arranged by voice section. -> Registration for Choral Festival will occur online. -> There will be a $12 participation fee per individual to register for Choral Festival (including conductors), which will include lunch for all participants in Stav Hall (ranked in the top-five college cafeterias in the country by The Princeton Review! ), along with an admissions info session and Q&A panel with St. Olaf ensemble musicians for high school attendees. ->Junior and senior high school students are invited to stay on campus overnight following the concert, so they can attend our Fall Visit Day on November 5. Students will need to register individually for this opportunity here. -> “We Walk in Love” by Deanna Witkowski (You may download and print the free sheet music here). The score is licensed with Creative Commons for free, non-commercial distribution worldwide. Attribution is the only requirement, so if you upload a video or a recording, you must list Deanna Witkowski as the composer. It is recommended that you print the score double-sided with the page 1 licensing information included. *This version was updated on August 31 – please ensure you’ve downloaded the updated file before attending the festival. -> “How Lovely are the Messengers” (St. Paul) by Felix Mendelssohn/edited an prepared by David Cameron (You may download and print the sheet music here). *All singers are expected to acquire the proper scores and prepare their part before arrival. Singers must also number the measures in each of their scores (note: xeroxed copies will not be permitted). The college wants to assure the safety of minors who visit our campus. Below is the link to the online form we ask the group leader fill out when they bring high school groups to campus. The information must be passed on to the students in whatever way seems easiest. Reading the form out loud to them in class or on the bus before arrival would suffice. Anton Armstrong is the Harry R. and Thora H. Tosdal Chair in Music, Professor of Music at St. Olaf College and Conductor of the St. Olaf Choir, a position he assumed in 1990. The very first time Levi Wick ’19 visited St. Olaf College, he sang alongside hundreds of students and community members as part of Choral Festival. He was mesmerized by the beautiful sound.